"Reject exists since summer 2007. At this time the bandmembers where Stefan (lead-guitar) and Benjamin (vocals). They started to search musicians who want to play with them. 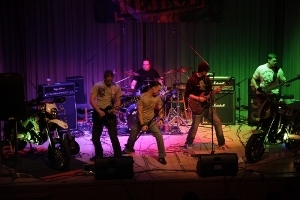 First they found Jürgen (drums) who was playing in two Metal-Bands before. Then they where searching for a bass-player, but they didn't find one for a long time. So they decided to get a rythm-guitar-player, before they go on with searching a bass-player. So they found Simon (rythm-guitar). Finally they also found a bass-player. His name is Christopher (bass) and he was playing with Jürgen in the two Metal-Bands before. The musical style of Reject developed since the time when Benjamin and Stefan where founding the Band. First they where on a Rock n' Roll style. By working with those Metal-Guys they developed their style to a Hardrock-Metal combination which is not easy to define. They keep on working and developing their sound since summer 2008 and they enjoy working with music very much. They recorded a Demo in summer 2009. At the time they are recording their first Studio-Album and they hope you will be able to here it very soon." We would want to live in the US 40 years ago, where our style of music was getting famous. Summer, doesn't matter what month. Because it's warm. In Austria it's not very warm the whole year, but in summer we get the 25°C mark. We usually write our ´rythm-parts at the evening. For our lyrics we need the muse. She is inspiring us when ever she wants to. In a band every one has in own favorite instrument out of a couple of reasons. Our favorite drink is beer.